It's not easy to see another actor step into your shoes and play a role that you made famous. 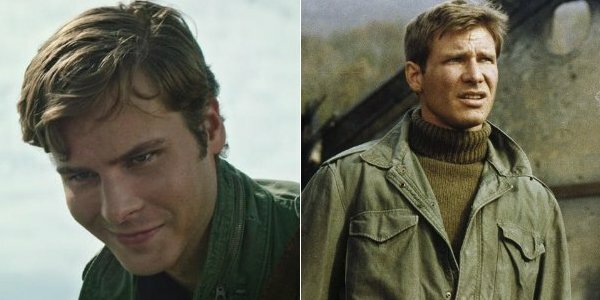 Yet for as weird as it may seem for Harrison Ford to witness the beginnings of the hunt for a young Han Solo, he's all for a new actor making the role his own. I would say, ‘Talk to your director. Watch the movies. And welcome aboard. Make it your own. While most actors would probably give some sort of well worn advice, Ford's words of wisdom are more meaningful than the thousands of "good luck" wishes a new actor would find themselves receiving when taking on such an iconic role. He isn't trying to brush off the next person to inhabit the role, but at the same time he's not going to launch into a huge speech on the importance of Han Solo's role in the Star Wars legacy. In other words, Ford is responding about the same way that Solo would in a similar situation. Harrison Ford is at a really cool phase in his career, where he doesn't really have to care too much about some "young punk" usurping his throne. It's a good place to be in, especially after his role in the Indiana Jones franchise was previously rumored to be going to Jurassic World star Chris Pratt earlier this year. While he's still in the game for a fifth film, we'd like to think that he wouldn't mind compromising with Pratt to have a half young / half old Indiana Jones adventure – much like he did during the run of The Young Indiana Jones Chronicles. With his role in Star Wars: The Force Awakens continuing the modern end of the franchise canon, Ford definitely doesn't sound intimidated that he'll possibly be sharing the public consciousness with a younger version of himself. That's assuming that Han Solo survives through the whole run of the new trilogy; as he's been rumored to be taking the Kessel Run in the sky during the events of J.J. Abrams' impending blockbuster. So knowing full well that Harrison Ford is comfortable with a new actor further enriching the role of Han Solo, the obvious question remains: who should get the gig? With the official blessing of Harrison Ford, whoever ends up playing Han Solo in the as of yet untitled spin-off will now only have to contend with the hopes and wishes of the movie-going public. As we've seen in the past, this can be the more demanding end of the spectrum, and as such we'll throw out our best wishes to whomever is bold enough to chase after this role of a lifetime. In the meantime, you can see the original Han Solo get a little wiser, while helping a new generation of rebellion in Star Wars: The Force Awakens, when it hits theaters on December 18th.